At the center of Atkinson's drama stands the compelling figure of Major General David H. Petraeus, described by one comrade as 'the most competitive man on the planet.' Atkinson observes Petraeus as he teaches, goads, and leads his troops and subordinate commanders in several intense battles. All around Petraeus, we watch the men and women of a storied division grapple with the challenges of waging war in an unspeakably harsh environment. But even as the military wins an overwhelming victory, we also see portents of the battles that would haunt the occupation in the long months ahead. Semi interesting. No objectivity. A bush basher with a penchant for monday morning quaterbacking. Worth listening to if you enjoy hearing both sides of the debate on the gulf war; however, the listener should be warned that this book is very much from the far left perspective and paints the US Military and the Republican administration in a very poor light. If you are supportive of our troops, this book will upset you. The author is blatantly demeaning and insulting at times. If you are interested in Military history and can handle opposing view points, then it is worth a listen. 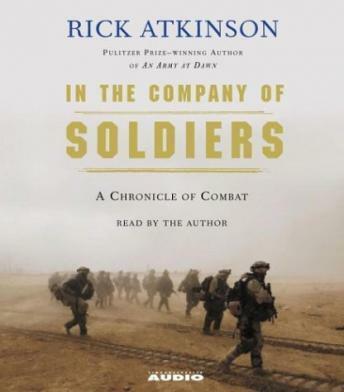 Until "In The Company of Soldiers" I have enjoyed all Rick Atkinson's book. This contemporary rendition of his experience in the second gulf war is highly disappointing. In his previous books he created an interesting factual recounting of past events. In this book he cannot resist injecting his opinions and interpretations of the events and causes of the second gulf war. This book reads more like a New York Times Op Ed or Editorial than a military history of what happened. Rick should stick to reporting and give up the editorializing. If you enjoy the far left, liberal view of the world and the war as served up ad nauseum by the New York "Sedition" Times you may enjoy this diatribe. If you are a centrist or conservative or value the least bit objectivity------skip this book. An entertaining and informative look at what our Armed Forces are like these days, and it's always nice to hear a book narrated by its own author. Looking forward to Atkinson's next WWII book - his contemporary style provides a refreshing perspective on historical topics.